How's 2017 working out for you so far? In addition to scouring the internet for incredible diets (Byrdie has some great options for all your summer holiday needs), you're probably also thinking about how to make your wardrobe look new this season without spending a fortune. Thanks to the confusing and changeable weather that is spring, we imagine you're struggling to know what to buy. But worry not, for we have just the 11 ideas to help you bring you wardrobe bang up to date. From simple styling updates to pretty high-street buys that will immediately elevate your look, there are many ways to upgrade your wardrobe for 2017. Keep scrolling for our guide to 11 micro-trends that will make you look and feel ready for spring. Style Notes: Like us, you've probably always stuck to this tried-and-tested formula: Your jumper goes over your shirt. But how about if you reverse it? Hello, chic new look. This works especially well if you also tap into the open-back trend too. Best worn over a slim roll-neck, and make sure you check out the open back of this shirt. Style Notes: If you're not already doing this, let us be the ones to tell you that socks are big right now. Simply wear a pair with any shoes you fancy. The "uglier" the clash of footwear against sock, the better, although we're particularly fond of sports socks right now. Furry sliders, Birkenstocks, or a pair of heeled sandals. Whatever takes your fancy. Style Notes: We already told you this was a trend at the end of 2016, but we guarantee that not-so-subtle fishnet tights will look super sophisticated under your favourite pair of jeans. We especially like to wear these under cropped flares. Style Notes: Yes, we know, these are very '90s, but the fact is that these trousers are going to be every fashion girl's leggings or trouser of choice. Take a styling tip from Pernille Teisbaek, and wear these with white heels. Style Notes: A late-comer, and one we didn't see coming, thanks to the beret being everywhere, the baseball cap made the rounds during fashion week. Keep yours minimal, and try matching with your shirt or another detail in your outfit. Avoid motifs, and go for the plain baseball cap. Style Notes: Who What Wear UK editorial director Hannah Almassi tried the corset trend in 2016, so it's no surprise that the big belt trend is making a comeback—it's a slightly watered-down iteration we can see everyone trying. Contrast this belt against a striped shirt or black top. Style Notes: Thanks to the Attico girls, Giorgia Tordini and Gilda Ambrosio, we're desperate to get our hands on some ankle cuffs. While you can't currently buy one of the brand's coveted pieces (sold out, obvs), we suggest you purchase a bracelet cuff and improvise. Simply place this one around your ankle. 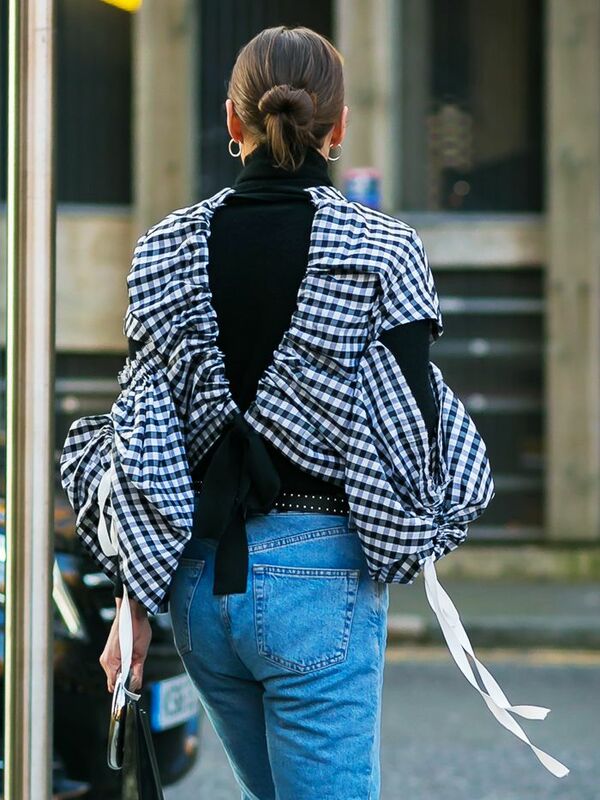 Style Notes: Yes, this is a bit pretty, but after we spotted Olivia Palermo wearing this look outside the Pringle show during London Fashion Week, we couldn't wait to try it. A classic knit that works however you want to wear it. If you're not too sure about tackling this look, then stick to the high street's pretty offerings. Style Notes: When it comes to big earrings, think Pat Butcher with extras on top. Just wear with a coordinated outfit to ensure you still feel put together and not as if you got dressed in a jumble sale. These will look incredible with jeans. Style Notes: If you recoil in horror at the thought of even reading the words "crop top," let alone wearing the actual item, fear not, for we have good news. Instead of exposing your midriff, the idea is to wear the piece over a shirt. Spaghetti straps are preferable with this look. Styling tip: Buy yours one or two sizes bigger to ensure it fits over your shirt. Want more? Prediction: These 11 new-in pieces will definitely sell out.